For warfare on the Internet, see Cyberwarfare. For the Underground Resistance album, see Electronic Warfare (album). Electronic warfare (EW) is any action involving the use of the electromagnetic spectrum (EM spectrum) or directed energy to control the spectrum, attack an enemy, or impede enemy assaults. The purpose of electronic warfare is to deny the opponent the advantage of, and ensure friendly unimpeded access to, the EM spectrum. EW can be applied from air, sea, land, and/or space by manned and unmanned systems, and can target humans, communication, radar, or other assets (military and civilian). Military operations are executed in an information environment increasingly complicated by the electromagnetic spectrum. The electromagnetic spectrum portion of the information environment is referred to as the Electromagnetic Environment (EME). The recognized need for military forces to have unimpeded access to and use of the electromagnetic environment creates vulnerabilities and opportunities for electronic warfare in support of military operations. NATO has a different and arguably more encompassing and comprehensive approach to EW. A military committee conceptual document from 2007 (MCM_0142 Nov 2007 Military Committee Transformation Concept for Future NATO Electronic Warfare) recognised the EME as an operational maneuver space and warfighting environment/domain. In NATO, EW is considered to be warfare in the EME. NATO has adopted simplified language which parallels those used in the other warfighting environments like maritime, land and air/space. For example, Electronic Attack is offensive use of EM energy, Electronic Defence (ED) and Electronic Surveillance (ES). The use of the traditional NATO EW terms, Electronic Countermeasures (ECM), Electronic Protective Measures (EPM) and Electronic Support Measures (ESM) has been retained as they contribute to and support Electronic Attack (EA), Electronic Defense (ED) and Electronic Surveillance (ES). Besides EW, other EM operations include Intelligence, Surveillance, Target Acquisition, and Reconnaissance (ISTAR) and Signals Intelligence (SIGINT). Subsequently, NATO has issued EW Policy and Doctrine and is addressing the other NATO defense lines of development. Primary EW activities have been developed over time to exploit the opportunities and vulnerabilities that are inherent in the physics of EM energy. Activities used in EW include: electro-optical, infrared and radio frequency countermeasures; EM compatibility and deception; Radio jamming, Radar jamming and deception and Electronic counter-countermeasures (or anti-jamming); electronic masking, probing, reconnaissance, and intelligence; electronic security; EW reprogramming; emission control; spectrum management; and wartime reserve modes. Electronic warfare consists of three major subdivisions: Electronic Attack (EA), Electronic Protection (EP), and Electronic Warfare Support (ES). Each of these is discussed below. Electronic Attack (EA) (previously known as Electronic Counter Measures (ECM)) involves the offensive use of EM energy, directed energy, or anti-radiation weapons to attack personnel, facilities, or equipment with the intent of degrading, neutralizing, or destroying enemy combat capability including human life. In the case of EM energy, this action is most commonly referred to as jamming and can be performed on communications systems or radar systems. In the case of anti-radiation weapons, many times this includes missiles or bombs that can home in on a specific signal (radio or radar) and follow that path directly to impact, thus destroying the system broadcasting. 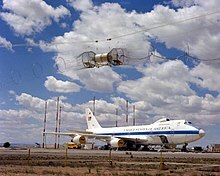 A right front view of a USAF Boeing E-4 advanced airborne command post (AABNCP) on the electromagnetic pulse (EMP) simulator (HAGII-C) for testing. Electronic Protection (EP) (previously known as Electronic Protective Measures (EPM) or Electronic Counter-CounterMeasures (ECCM)) involves actions taken to protect friendly forces (personnel, facilities, and equipment) from any effects of friendly or enemy use of the electromagnetic spectrum that degrade, neutralize, or destroy friendly combat capability (EA). So, EP brings with it the ability to defeat EA. Not to confuse the issue, but "jamming" is not part of EP, it is the target of EP. Jamming is an EA capability (see above). Flares are often used to distract infrared homing missiles to miss their target. The use of flare rejection logic in the guidance (seeker head) of an infrared homing missile to counter an adversary's use of flares is an example of EP. While defensive EA actions (jamming) and EP (defeating jamming) both protect personnel, facilities, capabilities, and equipment, EP protects from the effects of EA (friendly and/or adversary). Other examples of EP include spread spectrum technologies, use of restricted frequency lists, emissions control (EMCON), and low observability (stealth) technology. Electronic Warfare Self Protection (EWSP) is a suite of countermeasure systems fitted primarily to aircraft for the purpose of protecting the host from weapons fire and can include among others: Directional Infrared Counter Measures (DIRCM - protection against IR missiles), Flare systems (protection against IR missiles) and other forms of Infrared countermeasures (protection against IR missiles), Chaff (protection against radar guided missiles), and DRFM decoy systems (protection against radar targeted anti-aircraft weapons). An Electronic Warfare Tactics Range (EWTR) is a practice range which provides for the training of personnel in electronic warfare. 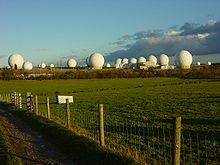 There are two examples of such ranges in Europe; one at RAF Spadeadam in the northwest county of Cumbria, England and the Multinational Aircrew Electronic Warfare Tactics Facility Polygone range on the border between Germany and France. EWTRs are equipped with ground-based equipment to simulate electronic warfare threats that aircrew might encounter on missions. Other EW training and tactics ranges are available for ground and naval forces as well. Electronic Warfare Support (ES) is a subdivision of EW involving actions taken by an operational commander or operator to detect, intercept, identify, locate, and/or localize sources of intended and unintended radiated electromagnetic (EM) energy. This is often referred to as simply reconnaissance, although today, more common terms are Intelligence, Surveillance and Reconnaissance (ISR) or Intelligence, Surveillance, Target Acquisition, and Reconnaissance (ISTAR). The purpose is to provide immediate recognition, prioritization, and targeting of threats to battlefield commanders. Signals Intelligence (SIGINT), a discipline overlapping with ES, is the related process of analyzing and identifying intercepted transmissions from sources such as radio communication, mobile phones, radar or microwave communication. SIGINT is broken into three categories: Electronic Intelligence (ELINT), Communications Intelligence (COMINT), and Foreign Instrumentation Signals Intelligence FISINT. Analysis parameters measured in signals of these categories can include frequency, bandwidth, modulation, and polarization. The distinction between SIGINT and ES is determined by the controller of the collection assets, the information provided, and the intended purpose of the information. Electronic warfare support is conducted by assets under the operational control of a commander to provide tactical information, specifically threat prioritization, recognition, location, targeting, and avoidance. However, the same assets and resources that are tasked with ES can simultaneously collect information that meets the collection requirements for more strategic intelligence. The history of Electronic Warfare goes back to at least the beginning of the 20th century. The earliest documented consideration of EW was during the Russo-Japanese War of 1904-1905. The Japanese auxiliary cruiser, Shinano Maru, had located the Russian Baltic Fleet in Tsushima Strait, and was communicating the fleet's location by "wireless" to the Imperial Japanese Fleet HQ. The captain of the Russian warship, Orel, requested permission to disrupt the Japanese communications link by attempting to transmit a stronger radio signal over the Shinano Maru's signal hoping to distort the Japanese signal at the receiving end. Russian Admiral Zinovy Rozhestvensky refused the advice and denied the Orel permission to electronically jam the enemy, which in those circumstances might have proved invaluable. The intelligence the Japanese gained ultimately led to the decisive Battle of Tsushima. The battle was humiliating for Russia. The Russian navy lost all their battleships and most of its cruisers and destroyers. These staggering losses effectively ended the Russo-Japanese War in Japan's favor. 4,380 Russians were killed and 5,917 were captured, including two admirals, with a further 1,862 interned. During World War II, the Allies and Axis Powers both extensively used EW, or what Winston Churchill referred to as the "Battle of the Beams". Navigational radars had gained in use to vector bombers to their targets and back to their home base. The first application of EW in WWII was to defeat those navigational radars. Chaff was also introduced during WWII to confuse and defeat tracking radar systems. As time progressed and battlefield communication and radar technology improved, so did electronic warfare. Electronic warfare played a major role in many military operations during the Vietnam War. Aircraft on bombing runs and air-to-air missions often relied on EW to survive the battle, although many were defeated by Vietnamese ECCM. As another example, in 2007, an Israeli attack on a suspected Syrian nuclear site during Operation Outside the Box (or Operation Orchard) used electronic warfare systems to disrupt Syrian air defenses while Israeli jets crossed much of Syria, bombed their targets, and returned to Israel undeterred. The target of the flight of 10 F-15 aircraft was a suspected nuclear reactor under construction near the Euphrates River modeled after a North Korean reactor and supposedly financed with Iranian assistance. Some reports say Israeli EW systems deactivated all of Syria’s air defense systems for the entire period of the raid, infiltrating the country, bombing their target and escaping. FM 3-36: Electronic Warfare In Operations. Safeguarding Soldiers Through Technology. Fort Leavenworth, U.S. Army Combined Arms Center (CAC), 26 February 2009 – PDF, 114 p., 4,5 MB. – See also: John Milburn: Army manual raises emphasis on electronic warfare. Washington Post, 26 February 2009. Jogiaas, Aadu. "Disturbing soviet transmissions in August 1991". Archived from the original on 14 November 2011. Bolton, Matt; Munro, Matt (2011). "The Tallinn Cables" (PDF). Lonely Planet Magazine (December): 48–55. Archived from the original (PDF) on 2013-11-13. ^ a b c d e f g h "Joint Publication 3-13.1 Electronic Warfare" (Online PDF available for download). Chairman of the Joint Chiefs of Staff (CJCS) - Armed Forces of the United States of America. 25 January 2007. pp. i, v–x. Retrieved 2011-05-01. EW contributes to the success of information operations (IO) by using offensive and defensive tactics and techniques in a variety of combinations to shape, disrupt, and exploit adversarial use of the EM spectrum while protecting friendly freedom of action in that spectrum. ^ a b "Electronic Warfare; Air Force Doctrine Document 2-5.1" (PDF). Secretary of the Air Force. 5 November 2002. pp. i, v–x. Archived from the original (Online PDF available for download) on 12 August 2011. Retrieved 1 May 2011. ^ Lichtman, Marc; Vondal, Matthew; Clancy, Charles; Reed, Jeffrey (Feb 2016). "Antifragile Communications". IEEE Systems Journal. 12: 659–670. doi:10.1109/JSYST.2016.2517164. ^ a b c "History of Electronic Warfare". Blogspot.com. December 7, 2009. Retrieved August 14, 2018. ^ Dickson (Col), John R. (May 1987). "Electronic Warfare in Vietnam: Did We Learn Our Lessons?" (PDF). DTIC.mil. Retrieved August 14, 2018. ^ Katz, Yaakov (September 29, 2010). "And They Struck Them With Blindness". The Jerusalem Post. Retrieved August 14, 2018. ^ a b Fulghum, David (November 26, 2007). "Israel Shows Electronic Prowess". Aviation Week and Space Technology. Retrieved August 14, 2018. ^ Administrator (February 11, 2015). "Russian Army Units of Eastern District Have Received New Borisoglebsk-2 Electronic Warfare Vehicles". armyrecognition.com. Retrieved August 14, 2018. ^ "Putins nya supervapen skrämmer Nato" [Putin's New Superpower Scares NATO]. Svenska Dagbladet. 16 August 2015. ^ Shoki Driver. "Russian Military News in English". shokidriver.blogspot.se. This article incorporates public domain material from the United States Government document "Joint Publication 3-13.1 Electronic Warfare, DTIC.mil".